Aisha McNeal joined Officekey in August of 2018 and proved herself a valuable asset to the team over the past several months. She primarily works out of our Blue Ash office. Before joining us Aisha interned and had a student worker position at Cincinnati Children’s Hospital in Talent Acquisition and Career Development. At Children’s she helped design the Post-Doc website and hiring flyer and helped set-up career programs including the High School Symposium BRIMS and shadowing opportunities for Medical Sciences students. 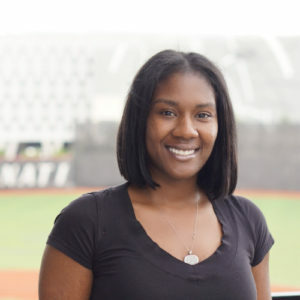 She graduated from Sycamore High School and recently graduated from the University of Cincinnati with a degree in Communications and two certificates in Public Relations and Organizational Leadership. Aisha has a daughter named Eden, who she says is “4 going on 34”. She also has an older sister and brother and a cat named Milk Milk. You can connect with Aisha or any of the OfficeKey staff on LinkedIn.